Styrene is a commodity aromatic chemical produced mainly from ethylbenzene- (EB-) based technology; it is easily polymerized to make plastics and resins. The major markets for styrene are polystyrene, acrylonitrile-butadiene-styrene (ABS)/styrene-acrylonitrile (SAN) resins, styrene-butadiene (S/B) copolymer latexes, SBR elastomers and latexes, and unsaturated polyester resins (UPR). About 80% of the world’s styrene capacity is based on the conventional process. The first step is to use ethylene and benzene to produce ethylbenzene (EB); the EB is then dehydrogenated to produce styrene. Much of the remaining global styrene capacity is based on a process to coproduce propylene oxide (PO) and styrene monomer (SM) in which EB is reacted with propylene in a PO/SM plant. It is important to understand these two major feedstocks, as they outline the styrene supply worldwide. Benzene, an easily transportable liquid, constitutes approximately 80% of the styrene molecule by mass and is an important component of the cost of styrene. By comparison, ethylene is only about 30% of the styrene molecule by mass, but it is a gas and is difficult to transport. For this reason, styrene plants are typically, but not always, located close to ethylene crackers. Over the last five years, global styrene consumption grew at an average rate of 1.5% per year. Consumption declined in the United States, Western Europe, South America, and Southeast Asia during 2012–17, while the other major players saw minimal increases, aside from China. 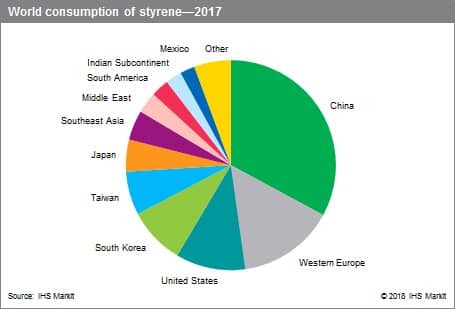 Northeast Asia (China, Japan, South Korea, and Taiwan) remains the dominant player in the styrene industry, driven by China, and China will continue to be the fastest-growing market in the region. The Middle East and Africa will be the fastest-growing regions among the smaller markets, with expected average annual growth rates of nearly 8% and more than 20%, respectively, over the next five years, following the new expansions in styrene derivative capacity. Overall, styrene consumption is forecast to stay relatively flat, growing at an average rate of 2% per year in 2017–22. Polystyrene drives styrene consumption worldwide. Of the total amount of styrene consumed in 2017, nearly 36% went into general-purpose/high-impact (GP/HI) polystyrene production and 21% went into expandable polystyrene (EPS) production. GP/HIPS is the largest demand segment in most regions; in China and Central Europe, expandable polystyrene has the largest market share. Polystyrene consumption continues to come under pressure from polypropylene and PET from both a cost and performance perspective, especially in packaging, the largest global market for GP/HIPS; global consumption remains below prerecession levels. EPS consumption was severely impacted by the economic downturn, but has grown steadily as construction markets have recovered. In construction markets, EPS is increasingly used as concrete forms and insulation, where higher energy-efficiency standards are driving demand. Styrene consumption into ABS resins, UPR, and SBR is expected to see the highest annual growth rates through the forecast period. ABS, the third-largest styrene derivative, is the largest-volume engineering thermoplastic resin in the world. ABS is used in many consumer-related end-use applications including appliances, electronics/electrical, building and construction, and transportation. Consumption of styrene into ABS resins is particularly strong in Southeast Asia and Northeast Asia. The ABS market is projected to grow at an average rate exceeding 4% per year over the next five years. Styrene is one of the highest-volume commodity chemicals traded, with about 30% of global annual production traded internationally. In 2017, global styrene trade was down from a peak in 2014–15. This decline in trade volumes reflects the increase in capacity in the traditional importing areas such as Asia and South America. Northeast Asia is by far the largest importing region, driven by China. China currently accounts for nearly 38% of global trade; however, by 2022, Chinese imports will fall closer to 21% of global trade, as the country becomes more self-sufficient. After a large amount of restructuring and rationalization since 2008, the global styrene industry has continued the long, slow process of recovery from the previous decade’s recession. Despite the improved performance and improving outlook for the global styrenics industry, low underlying demand remains a fundamental weakness. Consumption growth rates remain stubbornly below GDP growth on a global basis and this is unlikely to change. In 2017, styrene capacity exceeded consumption, and growth in capacity will continue to increase at a faster rate than consumption growth.